The metalhead (Lat. Flagellum Dei) is an interesting creature. Ever since its introduction in Europe in the early 1980s, the presence of the metalhead has been especially noticeable in its habitat, which has mainly consisted of milky white suburban areas, villages situated in the outskirts of medium-sized, rural municipalities, and the Graspop camping site. The males, with their low and obnoxiously loud voices, long, dusty mane, and somewhat unrefined movement, are easy to distinguish from other, more colourful species, such as the skater (Excrementus Inventadus), the emo (Fundamenta Concussa), the hiphopper (Extra Domum) and the attention-whoring goth skank (Felo De Se). Females, however, are recognised by their commonly oversized posture, their poisonously colourful hair and their low self-esteem. In this respect, the female metalhead perhaps most resembles the attention-whoring goth skank. In case of doubt, you can easily recognise the female metalhead by her submissive, sexually extrovert behaviour when placed within a five-kilometre radius of a rock star. Members of local wannabe bands will also suffice. Model 1.01a. In case of extreme insecurity or shamelessness, and/or absence of self-reflection, metalheads will develop an exoskeleton that protects them against all forms of social contact. The transition from the larval phase to the metalhead phase usually occurs between the twelfth and fourteenth life year of the specimen. The appearance of the metalhead is nearly always darker than that of the larva. Additionally, the hair length will increase in nearly all cases. According to some currents within in the realm of troll studies, this is the result of the decreasing bodily hygiene, which in turn serves to improve the immune system. Interestingly enough, the duration of the metalhead phase may differ greatly per individual. 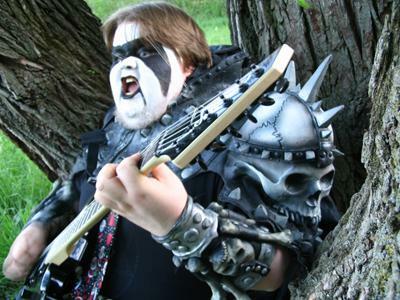 On average, the metalhead evolves into the glass-wearing hipster in its early twenties. Curiously enough, however, some skip this phase entirely, and transform immediately into the boring pen pusher (Agnus Diabolus). Scientists have not yet been able to determine the cause of this phenomenon, but some suggest that the chances of the metalhead of skipping the glass-wearing hipster stadium decrease when he is placed in the vicinity of a university campus. The most distinctive feature of the metalhead (and this applies to both genders) may very well be its call. It is commonly characterised by anglicisms and superlatives, preferably in combination with each other. When you register sounds such as ‘awesome!‘, ‘epic!‘ or ‘Slayer!‘, chances are that you are dealing with a genuine metalhead. In case of doubt, attempt to determine whether the creature utters the sound ‘ey, man!‘ at the end of sentences, for then you will be sure that it is not the teenager to hip for its own sake (Ira Deorum) you are dealing with, instead. Generally speaking, the metalhead is not dangerous and is likely to just panic in case of sudden movement. It is recommendable nevertheless, to conceal your presence for as long as possible, for the behaviour of the metalhead is best observed when the specimen is not disturbed or under the influence of stress. The metalhead is, within the zoomorphic context of this analysis, a social creature. It feels the most comfortable in packs with four to five congeners. Within the comfort of a pack, the metalhead tends to display more extrovert behaviour than when he is alone. For example, the creature seems to take pleasure in showing a(n often faked) interest in unusual activities, such as watching Sesame Street, blowing bubbles, asking a homeless person if it can be its friend, shouting “whores!” and, in extreme cases, public masturbation. Members of a pack often communicate with each other using codes. These codes can be, for example, certain calls, such as the ones mentioned in paragraph 2.01, or the attribution of special semantic values to seemingly random words (such as ‘sugar waffles’), values that are generally only recognised and understood by members of a certain pack. Scientific concensus dictates that this method of communication serves to strengthen the bond between the members of a given pack. Model 2.02a. 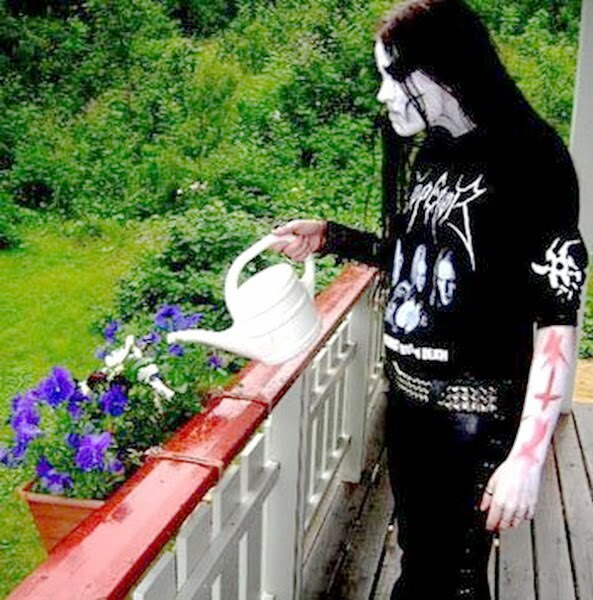 A faked interest put to practice: watering the plants. While the metalhead mostly is a kind-spirited creature, it can, in fact, react rather fiercely when territoriality comes into play. The peculiarity of territoriality among metalheads can be found in the fact that it is mainly expressed in a communicative rather than physical manner. For instance, some metalheads, mostly leaders of a pack, can mark their territory by proving their dominance over other species and even other packs by means of their music taste. During this curious ritual, calls such as ‘true‘and ‘old school‘ can be heard frequently. Be cautious, however, not to confuse this type of metalhead with the attractive academic, who can also choose to show their dominance by means of their music taste, but take a far less offensive approach, mainly apply their own analyses and thoughts instead of prebaked arguments taken from metal forums, and have a tendency to disguise their attacks in subtleties. The metalhead can also choose to attempt and triumph over other species using its political preferences. This is a delicate process that normally involves registering and subsequently twisting the statement of another species, after which an attack is launched in the form of an indignant rebuttal. The motivation for this offensive strategy can be found in extremities, such as obnoxious political correctness or mundane right-wing extremism. When it does occur that you are discovered during the observation of a pack, there is no reason to be afraid. As was already confirmed earlier, the metalhead is relatively harmless, and the members of a pack will, at most, try to overwhelm you with redundant, predictable humour. When this happens, do not panic: the metalhead is a shy creature extremely sensitive to witty remarks, a sudden aggressive and unreasonable approach, false accusations and mad social skillz. As such, feel free to resort to any of these methods to chase the metalhead back into its shell. The metalhead is, as said, an interesting creature. The unique combination of shyness and slight overconfidence can be found in few other species. If you do decide to dedicate yourself to the observation of this extraordinary being, make sure you reserve some carefulness. Ever since the late 1980s, the numbers of the metalhead have been dwindling, slowly but steadily reducing its presence back to the limits of its original habitat. A coarse approach would only speed up this process, seeing as the subsequent stress is enough to drive some species to (claim to) contemplate suicide. And in the end, it is our duty to make sure that future generations can still behold the metalhead in its natural surroundings instead of captivity (i.e. youth detention and psychiatric wards). Oh, I am nostalgic now. Don’t forget, though, that in some rare cases a metalhead can become so jaded, he develops into the attractive academic (Metallum Nigrum Rubiginosus) and dedicates his life to denouncing past sins. I wouldn’t know. I’m still in my glass-wearing hipster stage.